For a very long time this Kanté Manfla has been a complete and utter mystery to me. And to be frank, he still is. When I first heard his music, it was clear to me that, despite the fact that he had recorded in Abidjan, he was in fact from Guinea. You don't have to be a great expert to hear this. His "Wamolo" is the same song as Paillote's "N'Dianamolou"(from SLP 3). And all the other tracks on the first EP I heard could have easily have been performed by Bembeya, Orchestre de la Garde Republicaine or any of the other glorious orchestres from 1960s Guinea. I hasten to add that any recording on Syliphone has a head start, just from being recorded by one of the most original and authentic labels in African history. So who was this Kanté Manfla? It was soon suggested that this must be one of the Kanté Manfla's with a history with one of the great national orchestras. But he doesn't sound a bit like either the singer with the same name from Les Balladins or like the one from Les Tambourinis or Paillote. A usually reliable source suggested it was the Kanté Manfila who often is heard on Guinean radio, with just an acoustic guitar. Although I had no way of confirming this, it seemed unlikely. I have asked several people who visited Conakry to check if they could find any more music by or information about this remarkable artist, - but no luck there. Even older musicians were unable to identify the artist and his music. Then a friend found two more EP's, - and confusion reigned again. The first of the two contained a cover of Bembeya's "Loi Cadré" titled "Bara Serah"; and then there is "Nebi Ikononnan", a version of a (non-Syliphone) Bembeya song featuring Aboubacar Demba Camara and probably titled "Conakry Capitale" (which I will post at a later date). Just listening to the music one would be tempted to date this version before the one by Bembeya. But did Bembeya copy it from this Kanté Manfla, of whom nobody had heard in Guinea? The real 'killer' came in the first song of the second EP when the singer cited the name of Sory Bamba. Sory Bamba? What was he doing there? Was this what he was doing before he took charge of Kanaga, the regional orchestra of Mopti? The B-side left me even more confused. This starts with a song commemorating John F. Kennedy, who as you may remember was assasinated in November 1963. If the song was anything like current, it would date all these three records in 1964, or earlier (and therefore older than any of the Syliphone songs)! Enlightenment came when I saw the "Clash Mandingue" CD on the Oriki Music label last year. Of course! Studying the sleeves again I recognised the overbite of the later guitarist of Les Ambassadeurs. I had heard that this Kanté Manfila had a history with Les Ballets Africains, which helped to explain the (mutual) source of his and Paillote's songs*. There remain, however, plenty of questions unanswered. The recordings on "Clash Mandingue" are said to have been made in 1968. Also they were originally released on the Ivorian Djima label. But these three EP's are on the Philips label, and re-released from the (also Ivorian) Safie Deen label. Also I would estimate - as I have indicated before - these songs to be from 1964 or earlier. So what does it mean? Did Kanté Manfla and Sory Bamba meet and record before? If there is anyone out there capable of solving this mystery, please step forward! *In fact, most bands from that golden era of Guinean music found a great source of inspiration in the repertoire of Les Ballet Africains. Whenever I have doubts about Kante Manfila,resort to the PAM Edition CD, which contains some very interesting notes. Now my desires, hear Mr. Manfla ?? There are three kanté manfila or manfila kanté – all three singers and all three cousins with the same grandfather: manfila kanté,one is kanté manfila(de l’orchestre balla), one is manfila kanté dabadou (de l’orchestre keletigui) and the third one is kante manfila (ex ambassadeurs). this was emphasized to me by gunter gretz (the m.a.n. from p.a.m.) when i showed him some 'kante manfila' 45s on vogue (8 or 9 in a series, acoustic guitar only), "you know this was not the les ambassedeurs guitarist"
Thanks very much World Service for posting these three 7" EPs by Manfila "Ambassadeurs" Kanté. 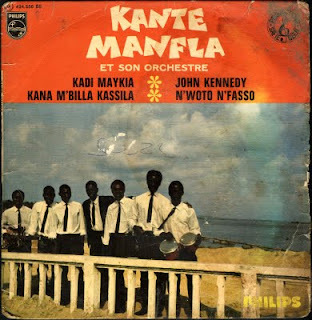 With this post, we can now enjoy most of Manfila Kanté's pre-Ambassadeurs recordings. The "Clash Mandingue" CD on Oriki which you mention rounds up in their entirety six other 7" EPs which were issued separately or together under the names of Kanté Manfla and Sorry Bamba for the Djima label (DAD 800, 801, 802, 803, 804, 833). Only two Djima EPs (that I know of) are missing: DAD 805 (Kanté Manfla) and DAD 832 (Sorry Bamba). Kanté Manfla. La capitale / Bint'a / Kamba / Ami Traoré. Production Safiedeen SD.176. 45 rpm disc. Sadly, I have not heard that record, but a scan from ebay shows a psychedelic cover in lurid pink, green and blue. A cartoon female face with blue hair is wearing large green shades with Manfila's face reflected in both lenses. The design is more redolent of Haight Ashbury than the Kennedy era. No doubt the record is later than the three records you have posted. However, I would be surprised if the gap is as wide as it would be if the recordings in your post date to 1964. In my subjective opinion, the music on the records you have posted sounds later, and comparable with music on the the Djima records from 1968. For example, the excellent guitar solo on "Kadi Mayka", the somg where Sorry Bamba is mentioned. If anyone has a copy of Sorry Bamba's autobiography, it may shed some light: Sorry Bamba, Liliane Prévost, "De la tradition à la world music" (1996). I am not sure whether it was Manfila "Ambassadeurs" Kanté or Manfila "Soba" Kanté (of Balla et Ses Balladins fame) who played with Les Ballets Africains. If I may be allowed to quote from holy scripture - in the bible on the subject: Eric Charry, "Mande Music" (p. 250), Charry writes "In the late 1950s and early 1960s the Vogue label issued a series of recordings that featured various members of Fodeba Keita's Ballets Africains, including guitarist Facelli Kante, Guinean singer Sory Kandia Kouyate accompanying himself on guitar, and singer-guitarist "Soba" Manfila Kante, younger brother of Facelli." Both Manfila Kantés were interviewed by Charry. I have not been able to recognise Manfila "Soba" Kanté on the record covers of Ballets Africains. However, comparison with the Balladins Syliphone covers shows it is definitely Manfila "Soba" Kanté pictured on the records mentioned by Chris M: six 7" EPs issued by Disques Vogue ca. 1961 (Echos d'Afrique Noire Vol 1-3, 6-8. EPL 7 835-837 /EPL 7 985-7 987). To my knowledge, the 24 songs on those EPs remain unissued. GREAT stuff again. Thanks for the introduction. My estimate of the date of these recordings is - as I wrote - based primarily on the Kennedy song. Soundwise it is difficult to make a comparison, and certainly with Syliphone recordings. Musically I would agree that they are from a more recent date. I have Sorry Bamba's autobiography ("De la tradition à la world music"). Sorry Bamba doesn't give exact dates, but he writes that he left Mali after N'Krumah's trip to China (Feb. 66) et went back to Mali just after Modibo Keïta's arrestation (Nov. 68). So he stayed in Côte d'Ivoire less than 2 years. (p.103) "Je rencontre le guinéen Kanté Manfilla, guitariste dans le célèbre orchestre N'Douba Koidio. Il dit vouloir créer un groupe, nous tombons d'accord pour collaborer. Il sera Chef d'Orchestre, guitare solo et chanteur. Je serai flûtiste, trompettiste et chanteur. Ensemble, nous recrutons les musiciens et nous donnons le nom African Style à l'orchestre." (p.107) "Le succès de l'African Style nous permet à Manfilla et à moi, et chacun de notre côté, de sortir de nombreux disques. Personnellement, je suis dans les mains de Pansonor, studio français, qui avait sorti mon tout premier disque avec le morceau fétiche Aouandi Gnogoma où je soulève le problèmes des mariages arrangés en Afrique. En plus, Manfilla et moi sommes en relation avec le producteur nigérian Djima Yanda, le frère ainé du célèbre producteur Bademos. Chacun de nous sort ses oeuvres et ensemble, nous faisons l'arrangement musical. Nos diques de 45T sortent au rythme de un tous les trois mois. Un disque rapporte la somme forfaitaire de 50 000 F CFA, plus les droits d'auteur. Une fois l'argent en poche, nous n'avons pas le souci de savoir si le disque se vend à un seul exemplaire ou à des milliers..."
(1967) Kanté Manfila et son orchestre. Horoya / Fara fina mobalou / N'mariama / Wamolo. Philips. 424.652 BE. 45 rpm disc. 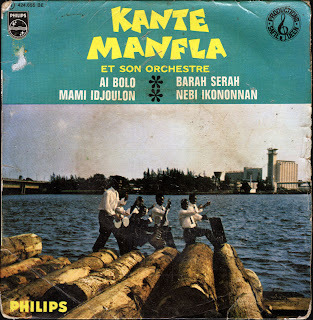 (1967) Kanté Manfila et son orchestre. Ai bolo / Mami idjoulon / Nebi ikononnan / Barah serah. Philips. 424.655 BE. 45 rpm disc. @Kiku: thanks for these excerpts!! It may be just me, but I have never heard of the "famous orchestre N'Douba Koidio". Apparently the name of the 'African Style' orchestra got lost too, or these records are not by this orchestra, or the orchestra not yet had taken on this name. Manfila "Soba" Kante sang with Les Ballet Africains. Charry states this on page 250, and that he is the brother of Facelli Kante. It is also evident by tracks which credit him as singer, eg, on Les Ballets Africains de Fodéba Keita. Volume 2 (Vogue CLVLX 299). In 2001 I showed the cover of the Philips EP with the track "Horoya" on it to Balla Onivogui but I have forgetten what he said! I emailed his answer to you, Wrldsrv, so if you still have the email check it out! Charry also states on page 446 that it is the Ambassadeurs Kante Manfila on the Philips EPs (all Ivoirean discs would be of him), and Kante "Soba" Manfila on the Vogue EPs. We are wandering a little from the subject of this post - Kanté Manfila of Ambassadeurs fame. However, in relation to "the Kanté Manfila who often is heard on Guinean radio, with just an acoustic guitar". 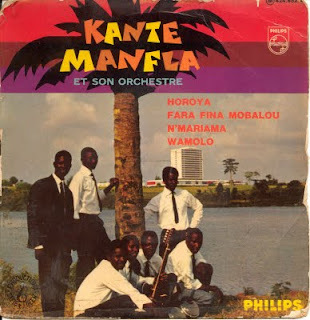 I don't suppose that this acoustic Kanté Manfila could be the same person as either Manfila "Soba" Kanté from Balla et Ses Balladins, or - perhaps more likely - Manfila "Dabadou" Kanté from Kélétigui et Ses Tambourinis? Both musicians played acoustic guitar outside their respective orchestras. As previously discussed, "Soba" played acoustic guitar on the early 60s Vogue recordings. And Charry (p.257) writes of "Dabadou" that he is an "accomplished acoustic guitarist who in the late 1980s had a solo success with the song Momangi." If the man on the radio is one of these two, it would have the advantage of reducing the number of Kanté Manfilas back to three. Incidentally, the elderly Manfila "Dabadou" Kanté appears in a great photo on this blog. As a young man he is pictured on Syliphone covers, but as an older man he is singing to a mic while Kélétigui plays sax in the 1996 photo attached to the "Kélétigui" obituary post of November 20, 2008. Manfila "Dabadou" Kanté died in 2002. I would be interested to hear more about the circumstances of that photo. My friends, the first time I came to this post and saw the photo in black and white Worldservice left us, I understood that he was giving the answer to the unknown, because in the sleeve of Phlips 424.652 BE we can clearly see from the left to Kante Manfila Ambassadeur and at the right kneeling beside the river to Sorry Bamba. After listening a while the album Douaou Den where K.M. Ambassadeur is the first singer and some more tracks a little older, I was sure that the first voice in Horoya, or the second voice in Mariama is the Ambassadeurs guitarist, anyone else in the world can issue that tone, in addition to the sheeps. Gentlemen, this is beautiful music, enjoy, dance, another day we will know more of the Kante M.
¡ Horoya la Guinee ! It's interesting - you use both transcription: Manfla and ManfIla. Are they are the same name? And another question - who knows something about Kante Manfila (I mean from "ambassaduers") in nowdays? Is he still in good health and have some activities? Many many thanks for these first three Kante Manfila (ex-Ambassadeurs) EPs. Kanté Manfila was born in 1946 in Farabanah, his family moved to Kankan 80 km to the north where Kanté went to school up to the age of 14. He then moved to Abijdan to live with an uncle since he could play already titles like baka,kaira and kensa on balaphon and guitar, he was able to earn some money by playing at marriages and other festivities of Guineans living in the capital of Ivory Coast. him that he might be arrested if he crossed the Guinean border. He decided to delay his return for three months and looked for a job. By chance the Ambassadeurs du Motel had a vacancy - three months turned into nine years and Kanté Manfila became "chef d'orchestre". Surely you knew the site of their ENDO discographies. Try the traducctor of google, it seems that the taduccion of Japanese-English is quite acceptable to satisfy curiosity. World Service- re your comment: "Nebi Ikononnan", a version of a (non-Syliphone) Bembeya song featuring Aboubacar Demba Camara and probably titled "Conakry Capitale" (which I will post at a later date). Just listening to the music one would be tempted to date this version before the one by Bembeya. But did Bembeya copy it from this Kanté Manfla, of whom nobody had heard in Guinea? PS your blog is superb - I should share with you items you may want, send me a list, I doubt I have much you don't but a Rock A Mambo nouvelle Formation is not that common? @yvesfrancois: How good of you to remind me of these Bembeya tracks! The origin of these is a mystery to me. I gather from Graeme Counsel that there are plenty of recordings which have not made it to the Syliphone records. So it appears there still is a lot of 'unearthing' to do. I don't know from what period the Bembeya tracks are, but I estimate these to be from the mid-1960s. I will post these soon. You are right of course about "Pesa Le Tout". I vaguely recall hearing a Cuban song with a similar melody line, but despite looking for this I have been (so far) unable to trace this. As you are probably aware, some of the greatest hits of African Jazz (and African Fiesta) were inspired by Cuban songs. hi all, enjoy your updates on the Kante Manfila (Ambassadeurs) mystery, but I am still wondering --- what is he doing today? I believe his last release was 'Kankan Blues'? There are videos of all three Manfila Kantés posted at: http://afrobox.net/members/superdadis. * Manfila 'Soba' Kanté - 'Sakhodougou' (the singer with Balla et ses Balladins, who earlier recorded solo and with Les Ballets Africaines for Disques Vogue). Manfila 'Soba' Kante mimes to the exquisitely beautiful Syliphone version he recorded with Balla et ses Balladins. * Emile 'Benny' Soumah miming to the blissed-out Syliphone recording of 'Kogno Koura', which he sang with Balla et ses Balladins. Impressive sideburns! * Kemo Kouyaté playing kora, harp and probably electric guitar on 'Badenya Kagnin' with the singer Minata. Kemo Kouyaté was the rhythm guitarist with Balla et ses Balladins and Quintette Guinéen, and the soloist on the live video of 'Sara' by Syli Orchestre National' that was posted by worldservice. * Kouyaté et Kouyaté, 'Faso'. Kemo Kouyaté plays kora to accompany the singer Kabine (Kabus)Kouyaté. Papa Kouyaté (ex-Keletigui et ses Tambourinis, Camayenne Sextet, and Quintette Guinéen) plays tumba at the end. * Momo Wandel Soumah - 'Tam Tam Sax' (ex-Keletigui et ses Tambourinis). Watch the young man abandon his hammock to Momo's mighty, prowling sax! Happy New Year to all. And many thanks to worldservice for another year of magnificent posts. 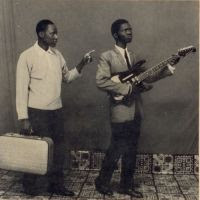 Another fact about about the resemblance style on Kante Manfla with the glorious Guinea orchestras in the 60's.